Is it a bird? No, it's clearly a plane. 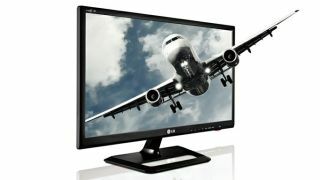 LG has unveiled a range of IPS TVs that can be used as a computer monitor as well as a television. Revolutionary, we know. The LG DM2752 and M2752 both come with LG's Cinema 3D tech, so you can enjoy all the eyeball-busting tri-dimensional graphics and dual-play just as on the high-end LG big-screen TVs we saw at CES 2012. The in-plane switching (IPS) means the two moniTVs (see what we did there) offer superior colour reproduction and reduced flickering, as well as an excellently wide 178 degree viewing angle. Also as standard is Picture-in-Picture (PiP) so you can keep watching and working at the same time (handy for the Euros and the Olympics, eh sports fans? ), with two HDMI ports meaning that procrastination can further be aided by Blu-ray players and games consoles. Other features include Infinite Surround Sound and USB quick-view which removes the need to boot up your computer before you can watch stuff from a USB stick. The LG DM2752 will be available in July, while the M2752 is out in select countries around Europe now, although it doesn't look like the UK is one of them. No word on UK or US pricing as yet; we'll let you know when we know.